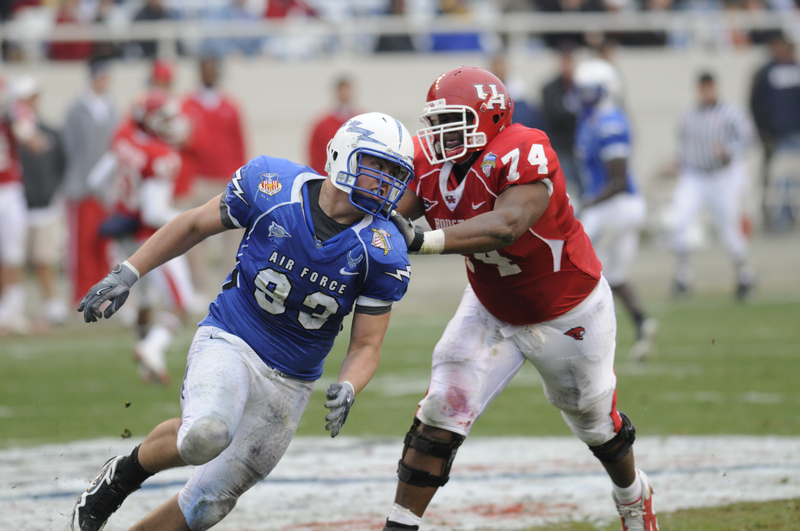 Air Force Academy grad and Denver Bronco defensive tackle Ben Garland chose to pass up on his pilot slot to give him a chance to play in the NFL, according to the Colorado Springs Gazette. Garland struggled with the decision after he was invited to Broncos training camp and played well last summer. He remains on their roster on the military/reserve list. Due to his military commitment, Garland must sit out another year and serve on active duty before he can apply to forgo his additional three years of active duty service for six years in the Reserve. Garland starred at the academy where he tallied 115 tackles in his career. In his senior season, Garland was named second-team All-Mountain West Conference after finishing the season with 4.5 sacks and 10.5 tackles for a loss . Rather than pursue a piloting career, Garland is now stuck fielding calls from hacks like us at After Action as big Air Force transferred him into the public affairs career field. We certainly won’t accept an NFL practice as a reason for not responding to a media query here at After Action. Working with the Air Force media, though, should help prepare Garland in dealing with the surly Denver press. My Family Supports you and WE Love you man. Good Luck and Go GET EM!